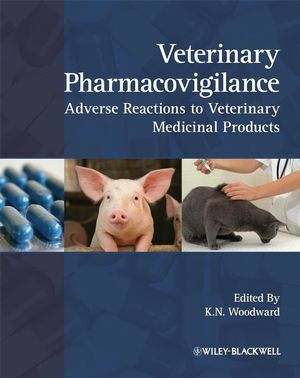 Veterinary Pharmacovigilance: Adverse Reactions to Veterinary Medicinal Products is an in-depth examination of veterinary pharmacovigilance, looking at the scientific methodologies involved, the role of regulatory agencies and legislation, and the underpinning science. Edited by a renowned expert, with over 20 years experience in the field, it draws together the expertise of authors from around the world. Adverse drug reactions may become apparent in treated animal patients, in exposed users or as adverse effects on the environment. They may also manifest as excess drug residues in food of animal origin. As a consequence, legislation and regulatory approaches have developed to address these issues and to ensure monitoring of continued product safety and, where necessary, the use of regulatory actions. All of these aspects are covered by the term “pharmacovigilance”. Veterinary pharmacovigilance is a rapidly growing discipline in both regulatory and scientific terms, and its importance can only increase as regulatory agencies across the globe seek to improve their hazard and risk assessment of marketed veterinary medicines by applying the techniques of post-marketing surveillance. Its roots include veterinary medicine, medicine, pharmacology, toxicology, pathology and, increasingly, ecotoxicity and environmental safety. This book will be fundamentally important reading for all involved in the field of veterinary pharmacovigilance including veterinarians, physicians, environmental scientists, regulators and those involved in drug development and market maintenance. Dr K.N. Woodward is Director of International Regulatory Affairs at Intervet/Schering-Plough Animal Health in the UK and has been involved in veterinary pharmacovigilance for over 20 years. He was formerly the Director of Licensing at the Veterinary Medicines Directorate (VMD) in the UK. He has also worked for the Health and Safety Executive on the regulation of industrial chemicals and non-agricultural pesticides and for the Department of Health where he was Scientific Secretary to the Committee on Carcinogenicity and held responsibilities for the safety of veterinary drugs. A toxicologist, he was Chairman of the Working Group on the Safety of Residues of the Committee for Veterinary Medicinal Products (CVMP, now the Committee for Medicinal Products for Veterinary Use) for over 5 years and a member of the CVMP. He was the leader of the UK delegation to the Codex Committee on Residues of Veterinary Drugs in Food in Washington for 3 years and a member of the Joint FAO/WHO Expert Committee on Food Additives (JECFA).